Learn the six habits of productivity. Reduce stress by getting your thoughts onto paper. Reduce frustration by assigning homes to stuff, tangible & intangible. Reduce fatigue by knowing what to do with incoming items. 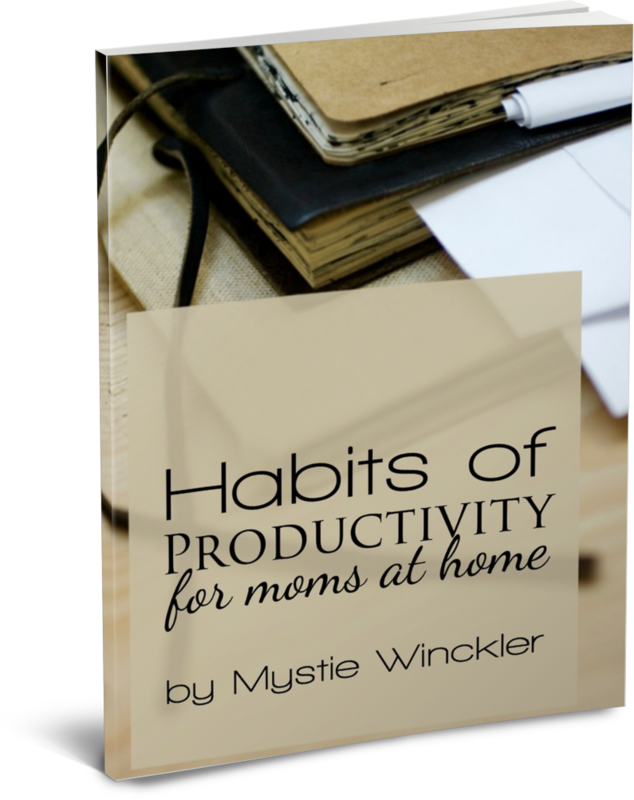 Habits of Productivity for Moms at Home will walk you step-by-step through writing down and processing what’s on your mind, what’s holding you up and slowing you down. Get help that’s written just for you. Most productivity advice is aimed at businessmen – people who can close their doors and determine their own projects and priorities. Moms are different. Our job is to respond with love and grace to the little people surrounding us. We don’t plan on diaper blowouts, toddler messes, and emotional meltdowns. But that is our business and we take care of it. Yet the principles of productivity apply even to us, though it looks different. We can feel more accomplished even when our days are derailed if our mindset is clear and our habits strong. David Allen’s Getting Things Done is a productivity classic, but does it have anything to say to stay-at-home moms? The tactics he outlines are brilliantly applicable not only to 9-5 office work, but even to our work at home, even to homeschooling. Follow six steps to adapt GTD to your life at home, managing many people and responsibilities.